Please note that we do not accept donations of encyclopedias, textbooks, or magazines. ​All donated materials should be clean and in good condition. Come visit the store and browse its wonderful collection. You are sure to find something you'll want - perhaps a mystery by your favorite author that you have not yet read, a cookbook with wonderful new recipes to try, a modern first edition to add to your collection or an investment guide to help you get fabulously rich. The choices are myriad and the ambiance warm and welcoming. 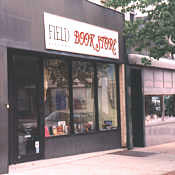 Located in an historic, turn-of-the-century brick building at 934 South Street in the heart of downtown Peekskill, The Field Library's used bookstore has been attracting book-lovers and bargain-hunters since it first opened. Items have been withdrawn from the collections of The Field Library or donated by library patrons and bookstore customers. This is recycling at its best! The donor gets a tax deduction, the bookstore customer gets great books at great prices and the library gets needed funds. The bookstore offers a wide variety of books, both fiction and non-fiction, all at bargain prices! Hardcovers usually sell for $3 and paperbacks for $0.50, though some special items may be priced higher. Our Romance Room boasts a large selection of Harlequins and Silhouettes at $0.25, 5 for $1.00. The store also carries records, CDs, cassette tapes and, videotapes and DVD's at similar savings. All proceeds benefit The Field Library. Bookstore proceeds have helped the library purchase special computer equipment and new library furnishings as well as to support children's programs and services.